Our fabric supplier, Camira, offers a wealth of useful advice on keeping fabrics clean – this applies to the upholstery on Evertaut seating as well as other fabrics used in commercial premises. 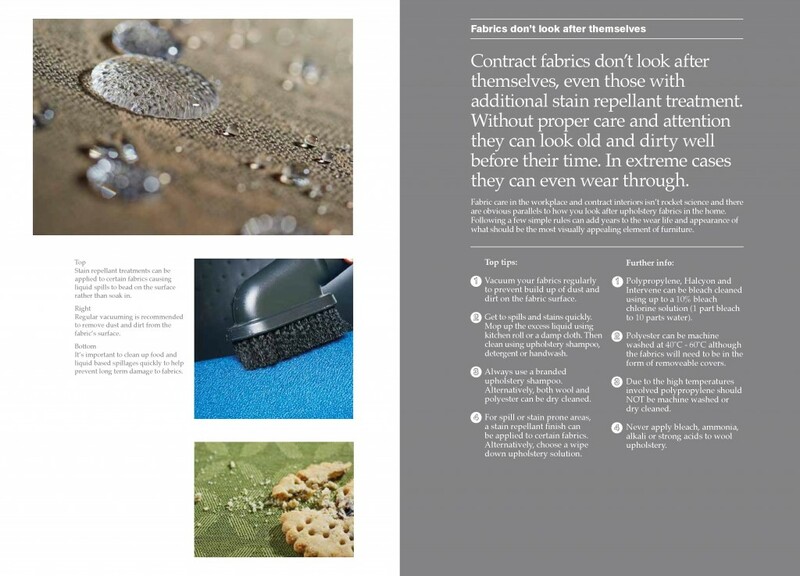 The advice below is taken from Camira’s Cleaning Guide which features top tips for fabric care and maintenance. Without proper care and attention fabrics can look old and dirty well before their time; even those with additional stain repellent treatment. In extreme cases they can even wear through. Fabric care in the workplace and for contract interiors has many obvious parallels to how you look after upholstery fabrics in the home. Following a few simple rules can add years to the wear life and appearance of what should be the most visually appealing element of furniture. – Vacuum your fabrics regularly to prevent build up of dust and dirt on the fabric surface. – Get to spills and stains quickly. Mop up the excess liquid using kitchen roll or a damp cloth. Then clean using upholstery shampoo, detergent or handwash. – Always use a branded upholstery shampoo. Alternatively, both wool and polyester can be dry cleaned. – For spill or stain prone areas, a stain repellent finish can be applied to certain fabrics. Alternatively, choose a wipe down upholstery solution. – Polypropylene, Halcyon and Intervene can be bleach cleaned using up to a 10% bleach chlorine solution (1 part bleach to 10 parts water). – Polyester can be machine washed at 40˚C – 60˚C although the fabrics will need to be in the form of removeable covers. – Due to the high temperatures involved, polypropylene should NOT be machine washed or dry cleaned. – Never apply bleach, ammonia, alkali or strong acids to wool upholstery. 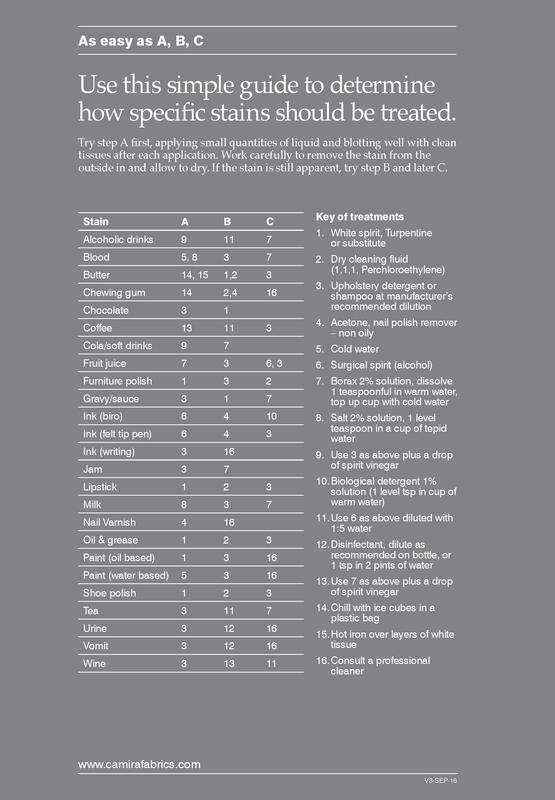 As part of their fabric care guide which you can view below, Camira have produced a handy chart detailing how to treat specific types of stains. You can click here to visit Camira’s website.